Heat olive oil in sauce pan and add (peeled) garlic cloves, oregano and red pepper flakes. Omit red pepper flakes if you don't want it spicy. Fry the garlic until slightly golden brown. Drain the canned garbanzo beans, reserving liquid. Add the drained beans to food processor. Add olive oil, garlic, oregano and red pepper flakes to the garbanzo beans. Add the juice of one lemon and the paprika then start the food processor. It might take a while for the beans to puree. Stop the food processor as needed to push beans down with a spatula. Add in garbanzo bean liquid to achieve desired consistency. Add in more of the spices and the salt to desired color and taste. Note: a serving is 1/4 cup. cut down on the olive oil - if you want the tahini taste without the calories, add just 3 or 4 drops of toasted sesame oil. the oregano makes this a little bitter. try blending/processing artichoke hearts with fat free italian dressing until smooth and add to ingredients for a creamy texture. add lemon zest in place of the salt. instead of red pepper flakes - put very dried out sundried tomatoes in a clean coffee or spice grinder and make tomato powder. the flavor is fantastic! better than the paprika in taste, although the paprika is high in anti-oxidants. A great dip for raw vegetables or to shmeer on some crisy bread. Light and creamy dip for chips and also a spread for wraps, burritos, chimi's and any other Mexican side dish. 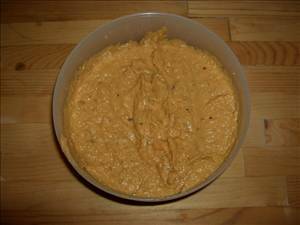 A low fat dip to serve with crudités or crackers. There are 140 calories in 1 serving of Hummus. Calorie break-down: 36% fat, 53% carbs, 11% protein.